When we think of the word boss, we usually associate our descriptions with someone who conducts orders and assigns responsibilities. However, today we’re here to offer you some guidelines of what you should expect out of your supervisor. Evaluating these steps should help you to understand the effectiveness of your current boss! Consistent Feedback: As you complete your daily tasks and fulfill your roles, we encourage you to ask yourself how frequently you are receiving feedback. Obtaining consistent feedback throughout project timelines will allow you to avoid instances in which you are requested to start over and will help you reduce a great deal of stress. Meaningful Conversations and Information: Although your boss may be strained between supervising several projects, they are still there to act as your valuable resource and guide. For that reason, as an employee, you deserve meaningful feedback, directions, and periodic meetings to evaluate your performance. If you feel as though your boss does not communicate in a meaningful manner, you may want to check up with a higher supervisor. Acception of Failure: At some point in your professional career, we can nearly guarantee that you will be faced with failure. Whether this is concerned with not meeting goals or deadlines, or creating a project that is not on par with original ideas, it is an inevitable component of any person’s career. However, having trust in your boss to provide constructive criticism instead of consequences will lead you to become more creative and trusting in your own capabilities. Appreciation and Praise: Again, with all of the work and effort you put into each day in the office, you deserve recognition for your accomplishments! As much as a boss serves as an outlet for critique, they should also behave as a cheerleader for their divisions! Without your work, the firm would not be able to function cohesively and successfully. 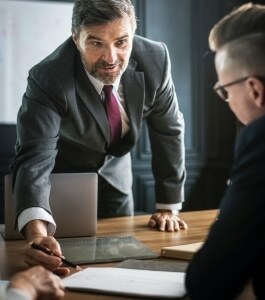 Effort Towards a Workplace Culture: A component of the workplace that continues to receive recognition and value is the culture constructed by top management. Your boss should be working to create an effective culture in which employees feel valued and motivated to achieve their professional goals. Without a recognizable culture, relationships between co-workers and supervisors will be negatively compromised. Demonstrate Proactive Problem-Solving Skills: As the ultimate guide of the team, your boss should be capable of offering different problem-solving skills, in addition to being able to understand varying environments and structural problems. It is perfectly acceptable to be stuck in a decision and receive help, it should be available to you! Trust in Their Employees: At the end of the day, we are all adults. And for that reason, we should be treated as such. Your boss should showcase trust in you and each of your coworkers by encouraging freedom of creativity. Feeling micromanaged causes stress, fear of failure, and ultimately hinders creativity. Asses your environment and how often you are encouraged to embrace your own, unique thoughts and ideas. Bosses are put in place to be an outlet of support and an ultimate voice of guidance. If your boss meets the above criteria, then we are confident that you are in an environment that will allow you to flourish as a professional. If these ideas do not align with your management, consider evaluating the value of your position and role in your firm. Transitioning into a managemental position? Find out how to succeed on your first day here!